Addison Timlin, Ally Sheedy, Keith Poulson et al. October, 2008. Young nun Colleen (Addison Timlin) is avoiding all contact from her family, until an email from her mother announces, “Your brother is home”. On returning to her childhood home in Asheville, NC, she finds her old room exactly how she left it: painted black and covered in goth/metal posters. Her parents (Ally Sheedy and Peter Hedges) are happy enough to see her, but unease and awkwardness abounds. Her brother (Keith Poulson) is living as a recluse in the guesthouse since returning home from the Iraq war. During Colleen’s visit, tensions rise and fall with a little help from Halloween, pot cupcakes, and GWAR. 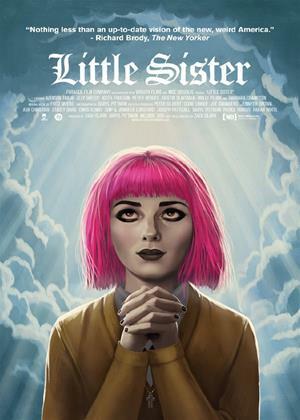 'Little Sister' is a sad comedy about family - a schmaltz-free, pathos-drenched, feel good movie for the little goth girl inside us all.